This week's Budget will be the last one to take place in the spring, assuming that the Chancellor Philip Hammond does not change his mind on the issue. He said last year that he wanted to simplify the whole business of setting taxes and government spending, which had become too complicated thanks to the process involving not one, but sometimes two, Budgets a year. So, Spring Budgets will again become autumn ones (the first will be later this year), while the other big set piece event, the Autumn Statement, will become a spring one (the first will be in 2018). This statement will no longer be a "major fiscal event", according to the chancellor, but simply a response to forecasts from the Office for Budget Responsibility. Opinion among accountants and tax advisers is that this change to the UK's law-making on tax is a very good thing. "I applaud his decision," says Anne Redston, visiting professor of tax law at King's College London, and author of Tolley's Yellow Tax Handbook. "It gives more time for proper consultation on any changes, which can identify unexpected consequences. "It allows things to be stress-tested by parliamentarians, commentators and others," she adds. Chas Roy-Chowhdury, of the ACCA accountancy body, says having one "fiscal" event each year "keeps it simple and stops overloading us with complexity". Reality Check: Are taxes going up to 1986 levels? What do businesses want from the Budget? Moving the Budget back to the autumn will also give the government more time to explain forthcoming changes which will typically come into effect the following April, at the start of the new tax year. That is an important consideration. Take the current revaluation of business rates, which is due to come into effect at the start of April. This has been in the pipeline for some time but is still causing consternation and even shock to some business rate-payers. "Springing new taxes late in March doesn't work very well, so makers of tax law need time to consult to improve the chance that tax law works as intended from day one," says George Bull, the senior tax partner at accountancy firm RSM. Mr Roy-Chowdhury points out that moving the government announcements matters to the general public as well. "If there is a range of changes twice a year to things like national insurance, personal allowances, pensions tax relief or savings allowances, it is harder for ordinary taxpayers to keep up," he says. However, it is possible for people to be given far too much warning of impending changes. Chancellor Nigel Lawson discovered that when his 1988 Budget announced the end of a valuable tax break for unmarried couples who were buying homes, known as multiple mortgage tax relief. Giving four months notice of its withdrawal, scheduled for 1 August that year, prompted tens of thousands of people to rush and buy properties before the deadline. That stoked up the rip-roaring 1980s house price boom to an even greater frenzy than before, and helped pave the way for the subsequent house price crash and the recession of the early 1990s. These days any concern about giving too much notice of tax changes tends to focus on the government's frequent attempts to stop tax evasion. But Ms Redston points out there are easy ways to deal with that problem. "You can announce what are called anti-forestalling measures or make the effect of the change, in the Finance Bill, retrospective back to the date of the announcement," she says. One problem that Chancellor Hammond will not find as easy to deal with is breaking from the recent trend for staging mini-Budgets. He might see his new, lightweight Spring Statements morph into new Spring Budgets, whether he wants them to or not. "If unexpected changes in the economy require it, then I will, of course, announce actions at the Spring Statement, but I won't make significant changes twice a year just for the sake of it," he said last year. Budgets back in the 1970s and 1980s were typically spring affairs. From 1976 they were also accompanied each year by the newly-created Autumn Statements which were dry, and rarely newsworthy, announcements of spending plans for each government department. Firstly, the Conservative Chancellor Ken Clarke effectively merged the two big announcements into one autumn Budget in 1993. 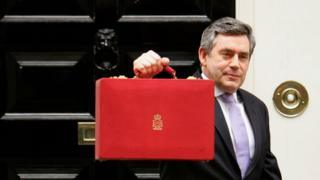 Later, Labour's Chancellor Gordon Brown moved the Budget back to the Spring but re-badged the Autumn Statement as a "pre-Budget report". That was when some of these autumn events started to morph, becoming mini-Budgets in all but name, and helping to gain Mr Brown a reputation of trying to micro-manage the economy. The Conservative Chancellor George Osborne continued the policy of two big set piece announcements each year, both effectively Budgets, though he resurrected the Autumn Statement name. What is the Budget and how does it affect me?